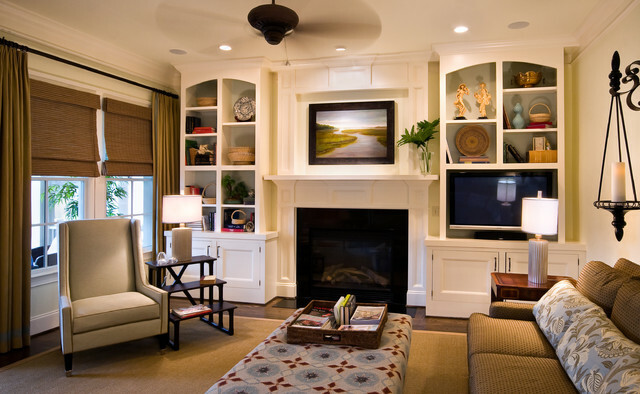 In this combination living room/ family room, form vs function is at it's best.. Formal enough to host a cocktail party, and comfortable enough to host a football game. The wrap around sectional accommodates 5-6 people and the oversized ottoman has room enough for everyone to put their feet up! The high back, stylized wing chair offers comfort and a lamp for reading. Decorative accessories are placed in the custom built bookcases freeing table top space for drinks, books, etc. Magazines and current reading are neatly placed in the rattan tray for easy access. The overall neutral color palette is punctuated by soft shades of blue around the room. Example of tv located within built-in. Bookcases. Note left one leaves room for curtain panel to tuck behind.